JEFFERSON CITY, Mo. — Missouri taxpayers should not be on the hook for more than $150,000 in legal fees for two attorneys hired to hold potential impeachment proceeding, according the chairman of the panel investigating then-Governor Eric Greitens. In a letter sent to Office of Administration Commissioner Sarah Steelman on June 11 Rep. Jay Barnes states that Greitens should be held liable for the bills of the lawyers he used for his own personal purposes. At play is $153,300 in legal fees billed to the State of Missouri for the work of two attorneys. The “Office of Governor Eric Greitens” hired Ross Garber and Edward Greim specifically for potential impeachment proceedings. Several elected officials have questioned the legality of the hiring. “Missouri taxpayers should not be on the hook for lawyers that Eric Greitens used for his own personal purposes. Accordingly, if Garber and Greim seek compensation, they should do so from Eric Greitens himself, not Missouri taxpayers,” wrote Barnes. In his letter, Barnes lays out several reasons why the state should refuse to pay for the two layers to represents Greitens. “In Missouri, taxpayer defense of elected official subject to impeachment proceedings was expressly and soundly rejected by the Framer of the 1945 Missouri Constitution,” Barnes pointed out. Going beyond that, Barnes said that for Garber and Greim to be paid by the state, the contract must first be deemed valid. The term-limited Republican contents that the contracts are not valid and should not be recognized by the state. Barnes is not the first person to question the validity of the contracts. 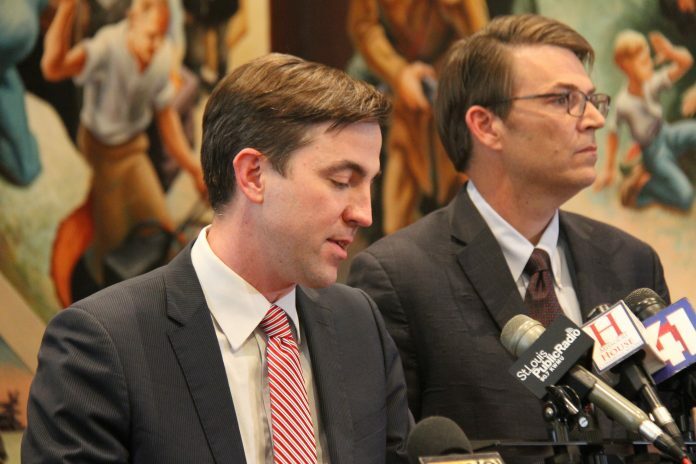 State Auditor Nicole Galloway and Attorney General Josh Hawley have both stated that the Office of the Governor didn’t have the authority to hire the two attorneys. In outlining his reasoning on the invalidity of the contracts, Barnes takes it a step further. He contents that the hiring of Garber and Greim is in direct contradiction to Greitens first act as governor — Executive Order 17-02. Barnes points out the Greitens personally benefited from the work of Garber and Greim. “Greitens used his office and, indirectly, the proceedings in the House, as leverage to secure his continued freedom,” states Barnes. Greitens resigned from office in order to get a felony computer tampering charge against himself dismissed.